One of the techniques used for mitral valvuloplasty for severe mitral stenosis is the double balloon mitral valvuloplasty technique. This is much less commonly used as compared to the Inoue balloon mitral valvuloplasty technique with reasons including complexity limiting it to experienced operators. However, there is a renewed interest in structural heart procedures with the popularity of the TAVR procedure and the Mitraclip procedure. In comparisons of balloon mitral valvuloplasty for severe mitral stenosis both the Inoue and the double balloon mitral valvuloplasty techniques have been associated with excellent results and outcomes. 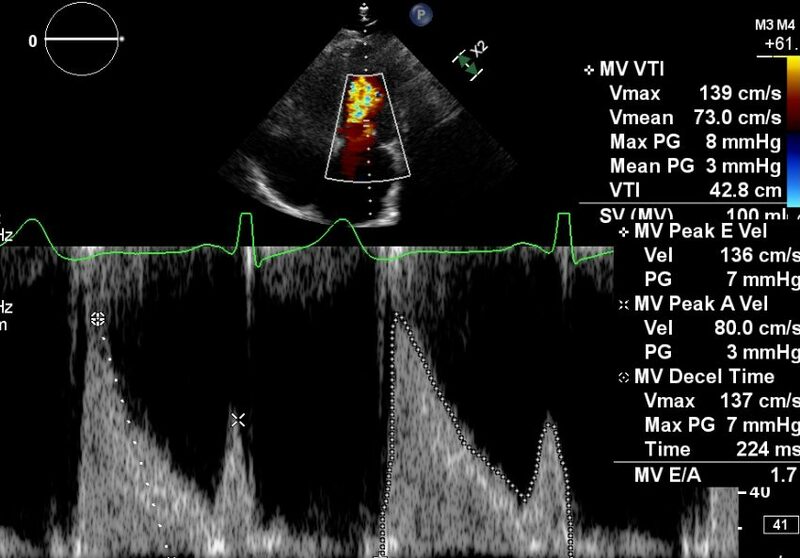 In this case we outline the use of the double balloon technique of mitral valvuloplasty in a case of severe symptomatic mitral stenosis secondary to rheumatic mitral stenosis. A woman in her 30’s presented with severe symptomatic mitral stenosis. 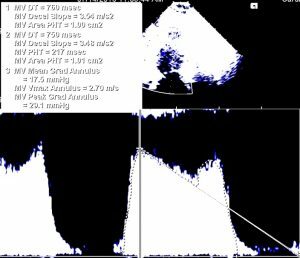 Echocardiography demonstrated the mitral valve had features compatible with rheumatic mitral valve disease and that it was suitable for balloon mitral valvuloplasty. Importantly there was no significant mitral regurgitation. In this case the double balloon mitral valvuloplasty was performed. 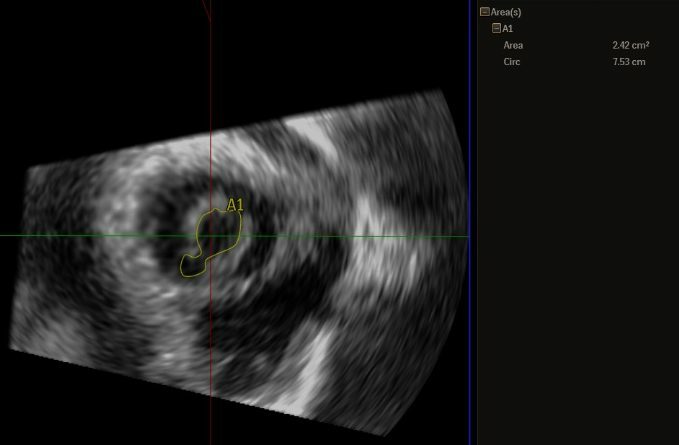 In this pre-procedural image, the mean gradient across the mitral valve is 18mmHg, therefore suggestive of severe mitral stenosis. 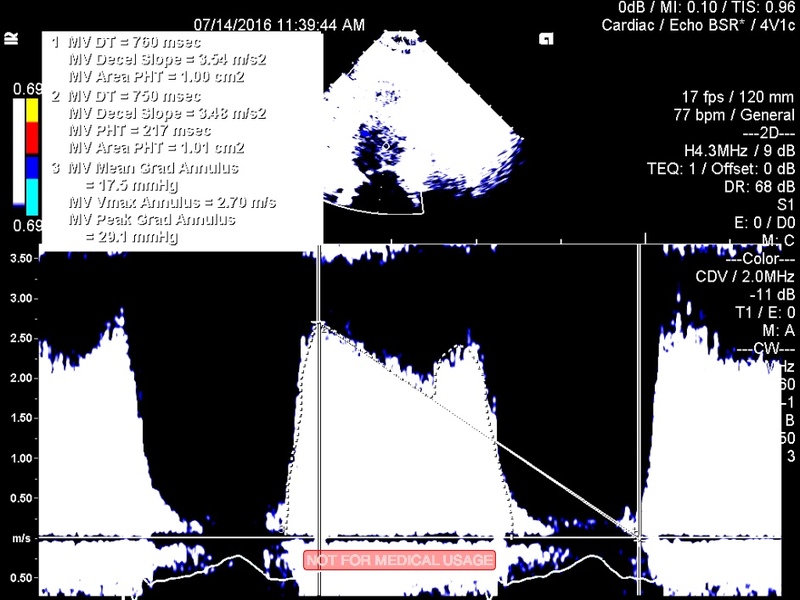 The Doppler waveform, and pressure half-time assessment also demonstrating severe mitral stenosis. Severe symptomatic mitral stenosis in those with suitable valve anatomy is a guideline indication for balloon mitral valvuloplasty. 3. In these images the valve is seen to have restricted opening. 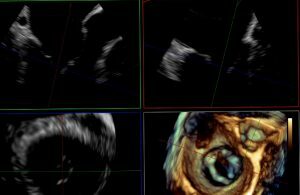 The fusion of the valve leads to a phenomenon called hockey sticking that is demonstrated clearly in these images of severe mitral stenosis. In these images of severe mitral stenosis the restricted opening of the valve leads to increased turbulence of the blood coming through it as it struggles to get across the valve. This is seen here as clear turbulent color Doppler images. In severe mitral stenosis the blood accumulates and can be stagnant in the upper chamber of the heart known as the left atrium. This is because the tight valve impairs blood flowing freely in to the bottom chamber. This phenomenon can be seen on echocardiography and is known as smoke. Access Is obtained in the right femoral vein (20fr) and the left femoral artery (5fr). In the left femoral artery a pigtail catheter was advanced to the aortic valve. This was done firstly to allow pressure measurements in the left ventricle allowing hemodynamic assessment pre and post procedure. Some people use this also for aortic root positioning to aid transseptal puncture. I prefer to use 3D-TEE and fluoroscopy for my double balloon mitral valvuloplasty procedures, particularly so when using the double balloon technique. 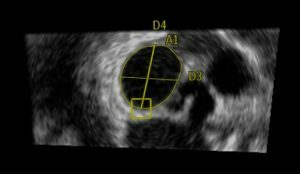 It allows accurate guidance of transseptal puncture, accurate characterization of the valve throughout the procedure, monitoring for complications such as effusion, and allows for accurate balloon positioning. In order to accurately and safely perform the procedure, accurate measurements are key. These also aid in optimal choice of balloons for the double balloon mitral valvuloplasty. In these images, 3D datasets and multiplanar reconstruction is used for the highest accuracy in obtaining annular measurements. The key is to stick low. Most operators are not used to this and it’s an important adjustment. In the Mitraclip procedure for mitral regurgitation, we stick relatively high and posterior at around 4cm. In paravalvular leak repair the stick is dependent on the leak positioning. In double balloon mitral valvuloplasty the stick should be low, I would say around 1.5cm above the valve. The main reason is to allow easier placement of the stiff wires that are placed in the ventricle. If the stick is high, the stiff wires will typically not track or seat well in the ventricle. Of course, heparin is given to prevent clot formation. Aim for ACT 250-300. Once through the septum I balloon dilate the septum with a 6-8mm balloon over the first placed LV wire. I use the technique I describe below to prevent having to stick the septum twice. Once through the septum, the anatomy was such that I opted to use a steerable sheath, Agilis, and place this in the left atrium. This is then maneuvered to face directly down on to the valve. A wire is then placed in to the LV apex, this can be done through a balloon tipped catheter. I use a preformed wire such as a Confida wire that is used by some in the TAVR procedure for severe aortic stenosis. This is stiff enough to allow balloon passage and stability, and the tip is less traumatic to the LV. Since it is a double balloon technique, 2 wires will be required. I find that if the Agilis is immediately over the valve, the 2nd Confida wire can be passed directly to the LV apex through the valve next to the first wire without the need for balloon tipped catheter. Here there are 2 wires that can be seen in the left ventricle. The mitral valvuloplasty balloons will be passed over each of these. Note the low position of the transseptal puncture that is required. The balloons are chosen and advanced to cross the valve and in to the LV, its important to ensure the balloons are across the septum to ensure a large defect isn’t created. In this case a 15 and an 18mm balloon were used. The balloons were advanced through the valve and positioned parallel to each other. Once positioning is confirmed and stable, the balloons are inflated simultaneously. Typically a waist will be seen on the balloon during inflation, this disappears as inflation continued and the fused commissures are split. 8. 9. This is the double balloon mitral valvuloplasty inflation. In these echo and x-ray fluoroscopy images, the balloons can be seen to inflate within the valve, the goal being to open the valve more and decrease the mitral stenosis. After the procedure, the valve is interrogated by the TEE to ensure increased leaflet opening, decreased gradient and to ensure the absence of complications such as pericardial effusion or severe mitral regurgitation. 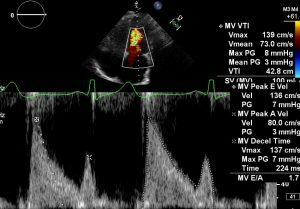 The gradient can be measured by direct hemodynamics from the LA/LV, the echo Doppler, and the 3D planimetry of the valve orifice. There should be some relatively mild commissural mitral regurgitation present that signifies good splitting. 11. In these images, the valve is seen after the double balloon mitral valvuloplasty. The valve now opens well and moves more freely, there is no severe mitral stenosis evident. The result is excellent. 13. 14. 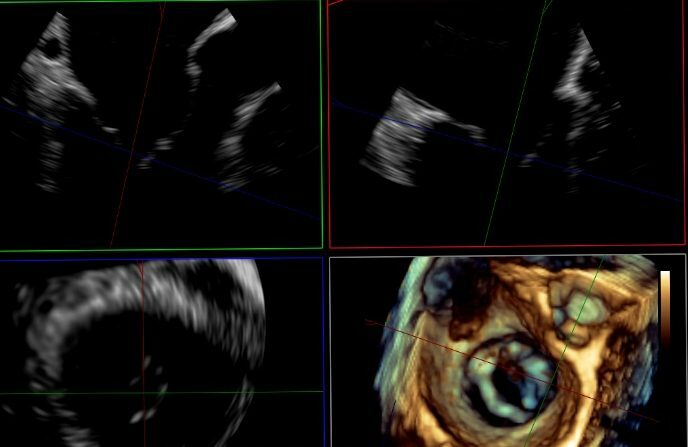 In these images, measurements confirm the much improved valve area after the double balloon mitral valvuloplasty. The mean gradient of 3 demonstrates a marked improvement, the waveform is also much more in line with a normal valve. The 3D reconstruction shows a much improved valve area also. The patient was doing excellent at 6-month follow up. She had no symptoms and felt back to baseline. The echocardiogram demonstrated that there was no significant gradient and the valve continued to open well. This was a very successful balloon mitral valvuloplasty result.